A common misconception is that Russian cuisine is as bland as German staples and as boring as British dishes. Not so! Of course you will find staples like potatoes, beets and bread on any Russian table, but Russian, Ukrainian and Belorussian cuisine can be as varied and diverse as many Mediterranean diets. That Mediterranean influence is not an accident, by the way. Today much of Ukraine was at one time a part of Greece and later the Turkish Empire. 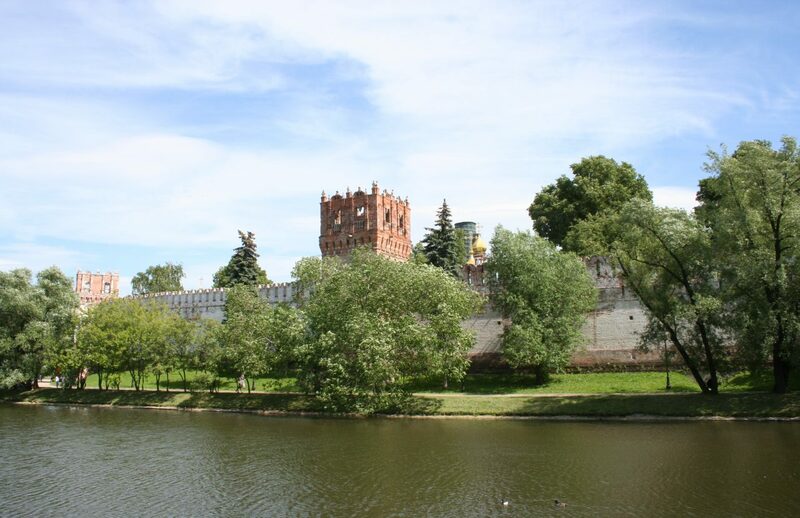 Aristocratic homes in Saint Petersburg and Moscow employed house chefs from France and Italy, and in fact at one time in history there were two common languages in Russia: French was the language of the educated and Russian was the common man’s language. Close ties remain to this day with countries like Greece, Cyprus and Turkey, and this adds a rich variety to the foods that are prepared in Russian kitchens. One cannot forget the Asian influence in Russian cuisine. Russia borders places like China, Korea, Kazakhstan, etc. In fact, Russia covers 51% of the Asian continent and as you can imagine, Asian dishes and ingredients are easily found in kitchens all over the former Soviet Union. Some Russian favoutries are soups, salads and breads. The cold climate means that salads are made of hearty vegetables, not the lettuce and lighter combinations found in the West. Russian salads are hearty and filling with a variety of ingredients that often pleasantly surprises visitors from the West. From the time of Catherine the Great, every family of influence imported both the products and personnel—mainly German, Austrian, and French—to bring the finest, rarest, and most creative foods to their table. This is nowhere more evident than in the exciting, elegant, highly nuanced, and decadent repertoire of the Franco-Russian chef. Many of the foods that are considered in the West to be traditionally Russian actually come from the Franco-Russian cuisine of the 18th and 19th centuries, and include such widespread dishes as Veal Orloff, Beef Stroganoff, and Chicken Kiev (Wikipedia, 2009). Cooking the Russian Way is a wonderful collection of authentic Russian recipes available via pdf. 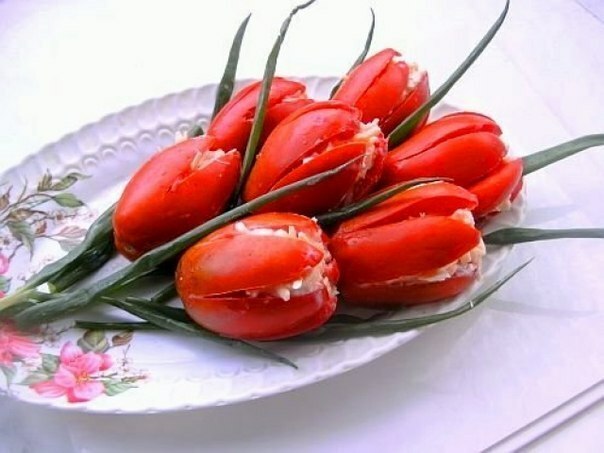 is the name for a meal taken between 6am – 1pm and generally consists of a range of protein based foods (cold meats, cheese and eggs) followed by bread accompanied with butter and творог (tva-rog), cottage cheese. is the name of a meal consumed between 1pm – 4pm and in today’s modern Russia is often considered just like a lunch anywhere in the West. In historic times this was the largest and most important meal of the day. is the term for meals between the hours of 5pm – 8pm and is generally the longest meal of the day as family members gather around the table. For a more exhaustive explanation of Russian meals see the page on Russian meal traditions and etiquette. To convert kitchen measurements between Metric and USA, follow this link. These are a “must have” for any Russian kitchen. Chicken cutlets is a Russian staple and easy to make. It is very easy to substitute chicken for beef, pork, lamb, or fish. 2 lb chicken breasts, skinned, fillet. 2 cup bread crumbs, dried. Put bread slices in a bowl and pour in the milk. Soak the bread for 15 minutes. Squeeze the bread dry being careful not to tear it up. Grind the chicken fine then combine with the bread slices. Gradually beat in the 1/4 lb of butter. Flavour with spices, greenery and salt, mix until the mixture is smooth. Make 6 cutlets from this mixture. Roll them in the bread crumbs coating them completely. Pour oil into large skillet and heat. Place over a medium heat and grill the cutlets for approx. 5-6 minutes per side or until done to suit your taste. Traditionally served with mashed potatoes (or rice), pour remaining butter over the potatoes. Kulebyaka is traditional Russian pie with a lot of filling and served as a main dish. Dissolve 10-15 grams (1/2 oz) of yeast in 50 grams (2 oz) of warm water or milk, strain through a small sieve and add liquid to make up 150 grams. Add 400 grams (14 oz) of flour and knead the mixture. When you have nearly finished kneading the dough, add 50 grams (2 oz) of butter, two egg yolks and a little sunflower oil. Put the dough in a warm place to rise, covered. When the dough has risen, roll it out on a floured board, place the filling in the centre, raise the edges of the dough and join them together by pinching. Decorate the kulebyaka with strips of the dough, placing them at intervals across it. Brush with egg yolk mixed with water, place carefully on a baking tray and bake in the oven. Kulebyaka is usually made with a meat or cabbage filling, but sometimes there are two or three layers of different fillings; for example, a layer of boiled rice, then a layer of meat filling and on top a layer of hard-boiled eggs, cut into rings. To make meat filling, mince 800 grams (2 lb) of boiled meat. Saute some finely chopped onions in a frying pan, add the meat and fry for 3 – 5 minutes. Add three chopped hardboiled eggs, 1-2 tablespoonfuls of sunflower oil, salt, pepper and dill to taste. For a cabbage filling, wash and shred a cabbage (1.5 – 2 kilograms – 3 lb – 4 lb), scald with boiling water, drain and rinse in cold water, put the cabbage in a saucepan with 80 – 100 grams (4 oz) of melted butter, and cook for 10-15 minutes, stirring constantly and pouring off the liquid. Then add some chopped hardboiled eggs and salt. Combine butter, parsley, tarragon, garlic powder, 1 teaspoon salt, and 1/4 teaspoon black pepper in the bowl of a stand mixer and whip together. Place mixture on plastic wrap or waxed paper and roll into small log; place in freezer. Place chicken breasts, 1 at a time, between 2 pieces of plastic wrap. Squirt chicken lightly with water and squirt the top of the plastic wrap as well. Pound to no less than 1/8-inch thickness. Season each piece of chicken with salt and pepper. Lay 1 chicken breast on a new piece of plastic wrap and place 1/5 of the compound butter and 1 tablespoon bread crumbs in the center of each breast. Using the plastic wrap to assist, fold in ends of breast and roll breast into a log, completely enclosing the butter; roll very tightly. Repeat with each breast. Place chicken in refrigerator for 2 hours, or up to overnight. Wrap up the remaining 1/5 of the compound butter to use for the breading. Place egg and water mixture in 1 pie pan. Melt the remaining 1/5 of the compound butter and add it to the 2 cups panko and parmesan cheese in a different pie pan. Stir the butter with the panko and cheese to fully combine. Dip each breast in the egg mixture and then roll in the buttered panko. Gently place each breast on a baking sheet, sealed-side down, and bake in 350 degree oven until golden brown, approximately 15-20 minutes, until the internal temperature reaches 165 degrees F. Serve hot. * To make ahead/freezer meal – After coating each chicken kiev, place in an oven- and freezer-proof baking dish or gallon sized freezer bag; then freeze. When ready to prepare, bake from frozen in preheated oven for 25-35 minutes or until the internal temperatue reached 165 degrees. Kulebyaka with Salmon is a very traditional dish found in the Siberian regions of Russia or anywhere there is access to water (other fish can be substituted for the Salmon). I love the Salmon over any other in this dish! Season the salmon slices with salt, pepper and lemon juice. Cook the rice in salted water. Drain and cool. Boil the eggs in simmering water for 2-3 minutes, then cool quickly under cold running water. Peel and put aside. Roll out the puff pastry. Place the smaller pastry sheet on a baking tray. Cover with 1/2 of the rice, then dill and 1/2 of the salmon slices. Place the eggs over the salmon. Sprinkle with dill, then cover with the rest of the rice, top with salmon slices and sprinkle any leftover dill on top. Season with salt and pepper and a squeeze or two of lemon juice. Cover with the larger pastry sheet. Decorate with small cut-out fish figures. Some chefs use peppercorns for the fish eyes. Make a couple of insertions into the pastry with a sharp knife, so the steam can evaporate during cooking. Bake at 200C for 20-30 minutes, until golden brown. Serve hot with sour cream or mayo. Do you remember the first time you saw someone cook with mayonnaise? Western tradition dictates that mayo must not become warm, else food poisoning could occur. Well, there is no truth to that and in fact the ingredients in mayonnaise retard spoilage. As in many other homes we actively cook with mayonnaise. 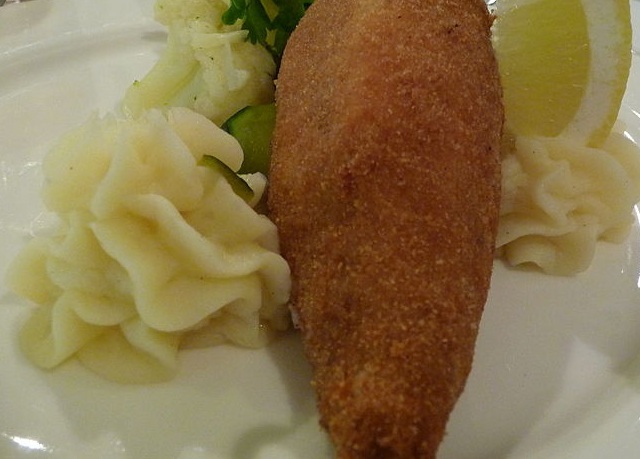 Here is an excellent recipe from the Mendeleyev kitchen: Baked fish–Moscow style. ¼ cup Dijon mustard or Dijon salad dressing. 2 tablespoons of chopped or flaked chives or parsley. Place fish in a lightly buttered baking dish. Bake @ 350 for 18-20 min or until the fish easily flakes. Align contents in a baking bowl and then spread the ingredients evenly over the fish fillets. Sprinkle the cheese or hash browns over top for browning. One of my favourite people in Russia was (by marriage) Uncle Mikhailovich, (Дядя Михайлович). He liked to say that “A fish in the belly and vodka in the glass makes a happy Russian.” I think of him with every fish dish and pray that his blessed memory be eternal. Preheat oven to 375F. Rub the fish with salt, pepper, the crushed garlic, and 3 tablespoons of the olive oil; place in a baking dish. Let stand for 15 minutes. Bake the fish until opaque throughout, 10 minutes for every inch of the thickness of the fish, measured at the thickest part — 40 minutes to 1 hour, depending on the size of the fish. The fish should be browned and crispy on top. Meanwhile place the eggplant / aubergine slices in a colander and sprinkle them with 2 tablespoons of salt. Let stand for 30 minutes. Rinse the eggplant thoroughly and pat dry with paper towels. Pour the remaining oil into a heavy skillet. If the oil is less than 1 inch deep, add more oil. Heat the oil over medium-high heat. Fry the eggplant slices, a few at a time, until deep golden on both sides, about 15 minutes. Drain on paper towels. Reduce the pomegranate juice over high heat to about 1 1/3 cups, taking about 10-15 minutes. Stir in the onion, minced garlic, red pepper flakes, basil and cilantro, and season with salt. Allow the sauce to cool to a warm temperature. Serve the dish surrounded by eggplant slices and pass the pomegranate sauce in a sauceboat. Clean the fish, salt it and fry on both sides until ready. Then cook the marinade: slice the vegetables, add pureed tomatoes and fry on slow fire until it is all tomato red. Then add water, make the mixture boil, add salt, vinegar and spice and cook for 15 more minutes. Pour the marinade over the fish and set aside for at least 5 hours. Peel the squashes, grate them on a big-hole grater, add an egg and flour, put in some salt and ground black pepper, and then mix well. Now you simply need to fry the pancakes in oil on a medium fire. They must be rather small, 3 should fit in an average frying pan, so just put a table spoon of the squash mix on the hot frying-pan, and the mix will take the needed shape itself. 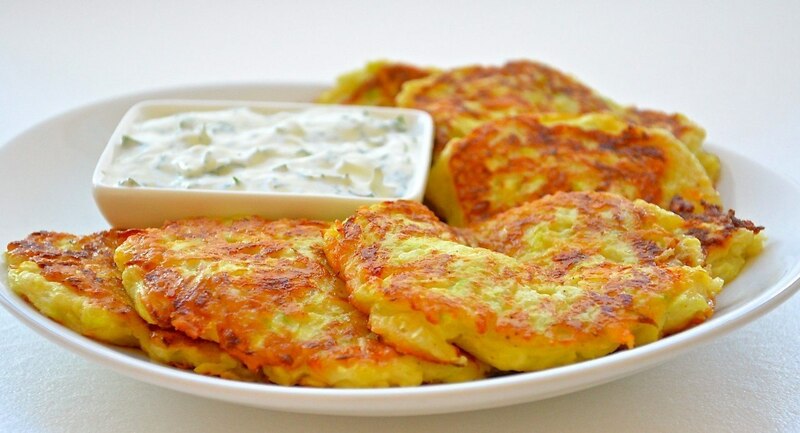 Fry from both sides, serve hot with sour-cream. Ingredients: 2 squashes, 1 egg, 2 tablespoons of flour, Salt, black ground pepper, and sour-cream. Peel and grate the squash, blend egg, mix well. Add grated cheese and crushed garlic clove, salt and pepper to taste; Dip in the flour and egg mixture. Gently fry in vegetable oil until golden brown. Pelmeni are similar to tortelloni stuffed with minced meat. It is believed that originated out in Siberia and was a popular food staple for hunters on their long trips across this vast and cold part of Russia. Pelmeni can be prepared and stored frozen for a long period of time before cooking. Today Pelmeni is a frozen food easily cooked and served at home. Pelmeni is very popular during the dark and cold days of a Russian winter. Засоленная сельдь: Of course no discussion of Russian cuisine would be complete without mentioning pickled herring. The prefect pickled herring is not too sweet and not too tart, with the right combination of pickled spices and timing for perfect texture. Marinated onions are a great additon! Лосось (la-SOCS) is salmon, a very popular feature on any Russian table. In the photo below it is lightly baked and served with rice. Salt, pepper, cayenne pepper – to taste. Cut the salmon into fillets. Apples should be cleaned, then cut in half, cored and cut into slices. Chop onion into half rings. Create boat or bowl of foil with high edges – like a small bowl. сало (SAH-lah) is raw bacon. Place a plate of salo with sliced onions, black bread, and a glass of vodka on the table and you’ll make Russian friends very quickly! Food observation: The Russian word for eggs is яйца (YEEt-sa). That part is easy. 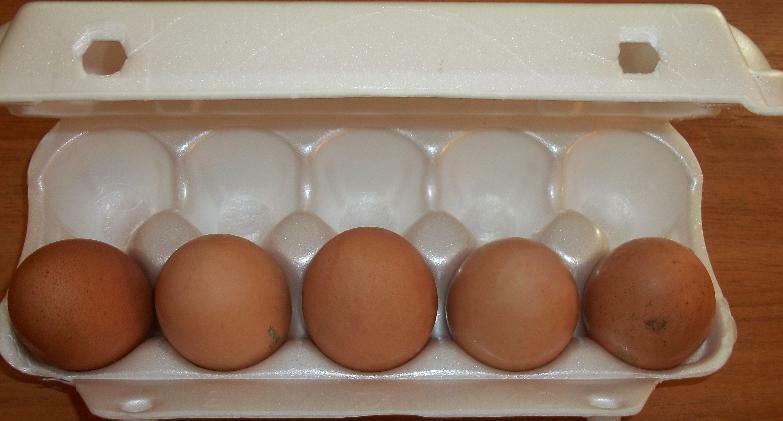 The hard part is figuring out why most egg cartons come with 10 eggs instead of a dozen. If the expression cheaper by the dozen is true, then I’d like to know why do stores sell them by 10 instead? Supermarkets and medium sized neighborhood markets feature boxes in Styrofoam cartons like most other places in the modern world, but in a group of 10. As eggs are not a breakfast staple in many homes, Russian housewives use them for cooking and baking and perhaps that is why they don’t come in a dozen. I asked one time and the blank stare and shrug of shoulders clued me in that not only did the shopkeeper not have an answer, but neither did she share my curiosity about how eggs are packaged. To be fair, in the small markets and kiosks you don’t have to purchase eggs in a carton. Just like potatoes, you can ask for 2 or 3 eggs. Or 4 or 5 if you’d like. They’ll be put in a small plastic bag, tied tight at the top and you are responsible for getting them home without breaking. Here is a really nice dish that is delicious, and it fits perfectly into the fasting menu constraints of the Orthodox Great Lenten season. Prepare all the vegetables and herbs. Pour boiling water over raisins and leave for a few minutes. Cut off the tip at the tomatoes, then spoon out the pulp. Put tomatoes on paper towels to dry. Cut the peppers in half, remove the seeds, leave the stems. Sprinkle peppers with olive oil. Put the peppers in a baking dish. Finely chop the tomato pulp. Drain the raisins and dry with a paper towel. In a frying pan, heat 2 tablespoons olive oil. Saute the onion and garlic until light golden. Add the ground almonds, but not all: leave 2 tbsp Mix well. Add the rice, tomato pulp, raisins, mint and 3 tablespoons parsley. Mix well. Remove from heat. Season with salt and pepper. Stir. Preheat oven to 200ᵒ C.
Sprinkle tomatoes with oil and place peppers in a baking dish. Spoon stuffing into them. Then place in the preheated oven for 20 minutes. Grind the remaining almonds with the remaining parsley in a blender. Remove the dish from the oven and sprinkle with a mixture of almonds and parsley. Drizzle with olive oil on top. Place back into the oven for another 20 minutes. Cut Tomatoes crosswise making an incision, take out a teaspoon of the core and scald briefly with boiling water. Combine the eggs, cheese, and cucumber, cut into small cubes. Shrimp cut into 2 parts. Mix with mayonnaise and combine with other salad ingredients. Stuff the Tomatoes with the tomato tulips. 1. Надрезаем крестообразно помидоры, вынимаем чайной ложкой сердцевину и ошпариваем кипятком. 2. Вареные яйца, сыр, огурец нарезаем на мелкие кубики. Креветки разрезаем на 2 части. Дважды пропускаем чеснок через чеснокодавку, смешиваем с майонезом и соединяем с подготовленными ингредиентами салата. 3. Получившейся смесью начиняем наши помидоры-тюльпаны. 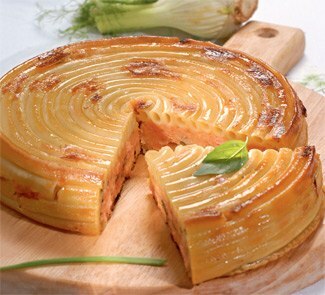 Macaroni Salmon Pie is the latest addition to the Mendeleyev Journal’s page on Russian & Ukrainian main dishes. dry white wine 3 tbsp. 9% fat cream 2 tbsp. unrefined olive oil 2 tbsp. Cook macaroni in boiling water. Cut Salmon fillet into large chunks. Then peel and chop Onions and garlic. Grate the cheese. Wash, dry and cover the parsley. In a skillet heat the olive oil and fry, stirring, onion and garlic, 7 min. Cut and cook the tomatoes into a sauce for about 5 minutes. Add fish, bay leaves, pour in the wine. Reduce heat, cook 10 minutes. Put the fish slices in a bowl. Remove bay leaf and continue to cook sauce over medium heat, until its volume is reduced by half. Add the cooked sauce, cheese, lightly beaten eggs and parsley leaves. Pour the cream, season with salt and pepper into the cooked macaroni. Form the dish starting from the center, put pasta on the bottom and sides while shaping a circlea. Fill the insides of the shape, cover with foil and place in preheated 180 ° oven for 1 hour in the form of Leave for 10 minutes and then serve on a large platter. белое сухое вино 3 ст. л.
сливки жирностью 9% 2 ст. л.
нерафинированное оливковое масло 2 ст. л.
шаг 1Помидоры поместить на 30 сек. в кипящую воду. Обдать холодной водой и снять кожицу. Мякоть измельчить. Филе лосося нарезать крупными кусками. Лук и чеснок очистить и измельчить. Сыр натереть на терке. Петрушку вымыть, обсушить и разобрать на листики. В сотейнике разогреть оливковое масло и обжарить, помешивая, лук и чеснок, 7 мин.шаг 2Добавить помидоры, готовить 5 мин. Положить рыбу, лавровый лист, влить вино. Уменьшить огонь, готовить 10 мин. Переложить куски рыбы в миску. Удалить лавровый лист и продолжать готовить соус на среднем огне, пока его объем не уменьшится вдвое. Дать остыть.шаг 3Лосося размять, добавить соус, сыр, слегка взбитые яйца и листики петрушки. Влить сливки, приправить солью и перцем, перемешать.шаг 4Макароны отварить согласно инструкции на упаковке. Отбросить на дуршлаг и дать немного остыть.шаг 5Круглую форму смазать сливочным маслом. Начиная с центра, выложить по кругу дно и бока формы макаронами. Наполнить начинкой, накрыть фольгой и поставить в разогретую до 180°С духовку на 1 ч. Оставить в форме на 10 мин., затем перевернуть на большое блюдо. Beef Stroganoff anyone? A tasty recipe for this Russian favourite is found here. Anthony Bourdain says that one can learn much about a culture from the food. 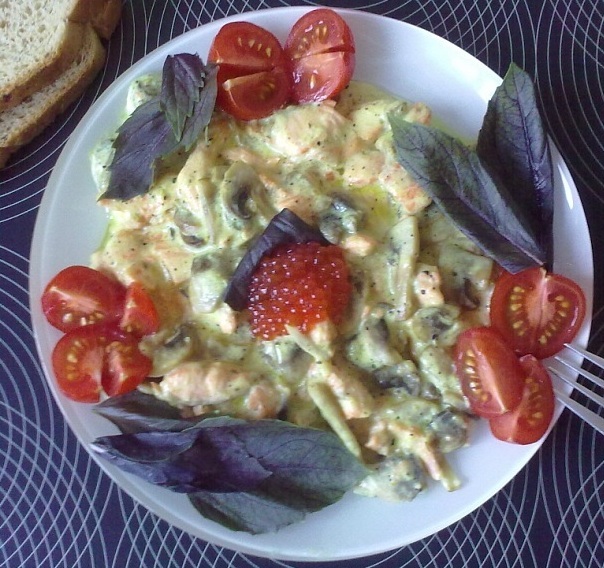 Here is a delightfully delicious Salmon with mushrooms in white cream sauce, sliced Roma tomatoes, topped with a spoon of red caviar and then garnished with fresh basil. Bread is a staple, present at every Russian meal. 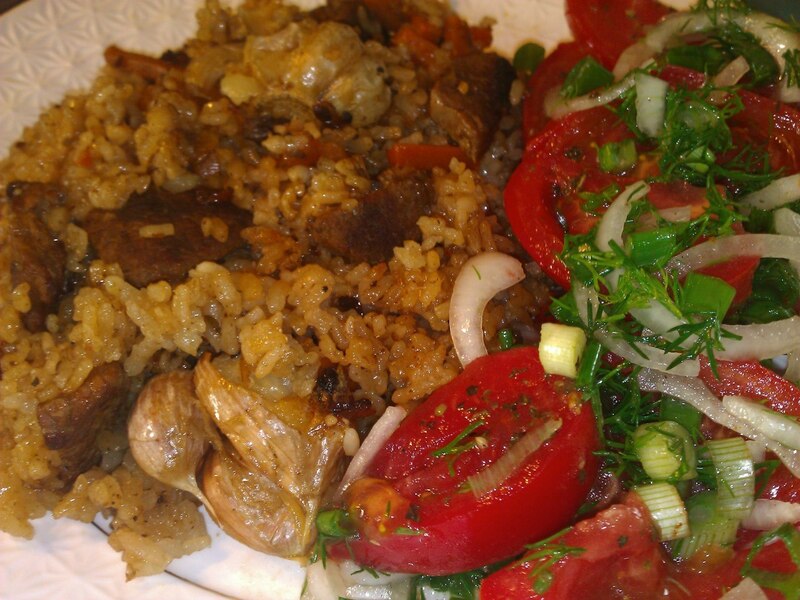 Plov (плов) is a middle eastern rice pilaf dish found often in places like Uzbekistan. Cooked all day in large containers outdoors, the dish is a delicious blend of rice, meat and vegetables with seasonings. Add the carrots and cook until carrots are tender. Pour boiling water into the pan to cover the meat and turn down the heat and simmer for an hour. Add rice over the meat slowly while stirring, add seasonings and increase the heat to / medium / high. After the water reaches boiling add the garlic to the rice and reduce the heat and simmer until cooked. When the rice is cooked reduce heat to low and leave for 30 minutes.